This writer remembers reading about Brazil’s Eder Jofre seeing a dead chicken ran over by a vehicle in the middle of the road. He never ate meat again. Jofre was 46-0-3 before this World Bantamweight champion was defeated. He added the WBC and WBA belts to his World belt. He had rematches with Argentina’s Ernesto Miranda, 15-3-1, who was living in Spain when they drew twice. He defeated Miranda twice when he was 40-3-4 for the South American Bantamweight title. Miranda ended his career with 99 wins. All four fights with Miranda were in Brazil. He drew with Manny Elias, 44-17-1, in November of 1965 between his only two losses to Flyweight champion Japan’s WBA, WBC and World champion Fighting Harada which both defeats were in Japan. It took almost five years to defeat Elias, 51-21-2 in their rematch. It was in May of 1970. The first Harada fight ended in a split decision in Nagoya, Japan, in May of 1965. The rematch took place after the Elias draw in Nippon, Japan, in May of 1966. Jofre’s third draw was against Uruguay’s Ruben Caceres, 11-1-5, in May of 1958 in Uruguay in Montevideo, Uruguay. 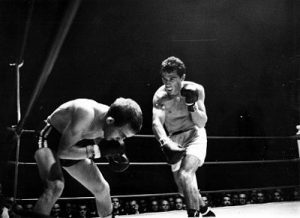 In their rematch in July of 1959 Jofre knocked out Caceres in 7 rounds. Jofre would only have his second bout outside of Brazil in August of 1960 when he defeated Mexico’s Jose “El Huitlacoche” Medel, 43-16-3, by 10th round knockout in a NBA Bantamweight eliminator at the Olympic Auditorium in L.A. In November he won the vacant NBA Bantamweight title knocking out Eloy “Emeterio” Sanchez, 25-12, in 6 rounds at the same facility. He had defenses against the former European champ then the Italian champ Piero Rollo, 53-6-6, stopping him in 9 rounds. He knocked out the OPBF champion Japan’s Sadao Yaoita, 43-9-2, in 10 rounds. He stopped the British champion Johnny Caldwell, 25-0, in the 10th round. Jofre would travel back to the US in his next fight and win the Bantamweight World title stopping Mexico’s Herman Marques, 19-8-1, living in Stockton, CA, in the 10th round at the Cow Palace in Daly City, CA. Then give Medel a rematch knocking him out in 6 rounds. Then Jofre would go to Japan for the first time knocking out Japan’s OPBF champion Katsutoshi Aoki, 33-1-1, in 3 rounds. Then travel to the Manila, in the Philippines, stopping Filipino Johnny Jamito, 33-2-2, who couldn’t come out for the last round after being knocked down in the previous round. Next Jofre went to Bagota, Colombia, knocking out Bernardo Caraballo, 39-0-1, of Colombia in the 7th round. Next up was the first loss to Harada losing his title. After the second loss to Harada he moved up to featherweight. It took fifteen fights for him to win the WBC World Featherweight title by majority decision over Cuban Jose “Pocket Cassius Clay” Legra, 131-9-4, living in Spain, over 12 rounds in Brazil. Legra would have two fights after this losing to Nicaragua’s Alexis Arguello in his last fight by knockout. In Jofre’s next two fights which were non-title he knocked out possibly Chile’s greatest fighter in Godfrey Stevens, 71-7-3, in 4 rounds. Then American Frankie Crawford, 38-17-5, was defeated over 10 rounds. In his first defense he would end the career of the former WBC champion Vicente “El Zurdo de Oro” Saldivar, 37-2.